Advantages: Excellent in all aspects. 16 pages of profiles, 17 pages of scale drawings and 90 images from the original manual. The first order of business is to clarify, if possible, the terms by which the subject of this excellent monograph is known. The aircraft was developed in 1934 by TsAGI (Tsentralniy Aero-Gidrodinamicheskiy Institut – Central Aero-Hydrodynamic Institute) which was headed by Andrey Nikolaevich Tupelov. As head of TsAGI, Tupelove was honored by having all TsAGI designed aircraft designated as ANT; in this case the aircraft was the ANT-40. Later when Tupelov fell out of favor with Stalin, the aircraft was re-designated the TsAGI-40. The military, however had referred to it by the initials for its intended mission SB (Sredniy Bombardirovshchik – Medium-Range Bomber) But with the second prototype, ANT-40IS (Ispano Syuiza) fitted with Hispano-Suiza engines, its performance as a high-speed bomber was quickly recognized and it was given the designation of SB (in this case, Skorostnoy Bombardirovshchik -High-Speed Bomber). As for the “2”, it refers to two engines. More specific designations were given and referred to the type of engine and any modifications. It also roughly referred to the year in which it was put in service. So an SB 2 M-103 referred to an aircraft produced in 1938 to 1939 with a 103 series engines having front mounted radiators, three bladed prop, external bomb racks, and a rear view-mirror. An SB 2 M-103U would differ in that it was produced in late 1939 and had the radiators under the engine with a shutter control. Now that we have that straightened out, back to the monograph itself. This is the second publication from a relatively small aircraft publishing house called Icarus Aviation Press, now located in the cornfields of Iowa. This volume is well written, in English, and printed on fine, heavy-weight, glossy paper. The numerous pictures are well reproduced and the quality paper only improves the images. 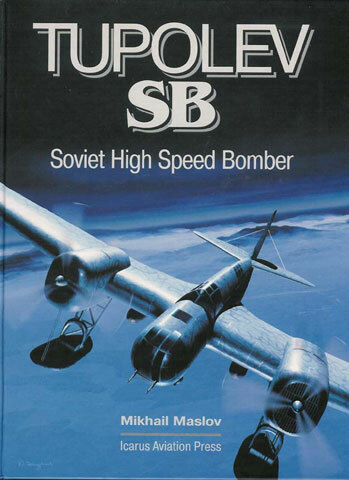 The book follows a very logical and well laid out organization, beginning with a brief overview of TsAGI and the predecessors of the ANT-40/SB 2 bomber. The first section of the book covers the SB 2 from the first prototype, the ANT-40RT, using the Wright Cyclone engine (the only radial engine model), through all the models, clearly setting out the various improvements and modifications made to the SB 2 and experimental models. This section also has a brief discussion of the internal and external painting of the SB 2. The next section goes on to describe the development of the Dive-Bomber version, variously designated as “N” RK, RK, SB-RK and finally known as the Ar-2 (Arkhangleskiy). The “–2” in this case meant bomber, as Stalin had decided that fighters should be designated with odd numbers and bombers with even number. The SB was not only used for military service, it was also adapted for civilian use as a high-speed transport and mail plane. This monograph provides excellent coverage in both words and pictures of this aspect of the SB. Being primarily a military aircraft, the author then looks at the SB in combat. He covers its use by a number of different countries in various wars and conflicts: The Spanish Civil War, the Soviet- Japanese conflicts of 1938 and 1939, combat service with the Chinese Nationalist Air Force, with the Czechoslovak Air Force as the license built B-71, in both VVS and Finnish service during the Winter and Continuation Wars and, finally, in the Great Patriotic War. The author then provides a technical description of the SB bomber which includes numerous drawings and pictures taken from the technical and production manuals. This wealth of information would be most valuable in modeling and includes excellent drawings and pictures of the well known, round M-3 turret. The book concludes with an excellent set of 1/72 scale line drawing of virtually every variant of the SB 2 and well done profiles . The profiles cover nearly 49 different aircraft in the markings of apparently every operator of the SB bomber – Soviet, Polish, Spanish (Republican and Nationalist), Chinese, Czechoslovakian, Slovak, German, Bulgarian and Finnish. This monograph on the SB bomber is one of the finest books I have had the privilege to review. I must admit however, that given the paucity of material in English on this aircraft, I may not be aware of major faults with this volume. But having said that, this still appears to be an excellent and highly comprehensive work on the subject. I only wish that the care given to the coverage of the SB 2 by the author would be given by other authors to other aircraft. I would also like to note that given the ever rising price of aircraft related books, this volume at USD$50.00 seems quite a value. I highly recommend this monograph to any aviation enthusiast, especially those who are interested in the VVS or twin-engine bombers, or both. My only regret is that I did not buy the now OOP 1/48 MPM vacform kit of the early version of the SB 2. Luckily I did buy, and build, the later version. One final note, Icarus Books is not only a small publishing house under its Icarus Aviation Press imprint, but it is also an excellent source of aviation related publications. Their specialty seems to be Russian and Soviet aircraft. Thanks to Bob Repich of Icarus Books for the review copy. All Icarus Aviation Press Books and other books on aviation are available direct from the publisher, who accepts credit cards (Visa, MC).